Neil Lennon hopes to have Florian Kamberi fit for Hibernian’s Europa League clash against Molde after resting him for their Premiership opener on Sunday. 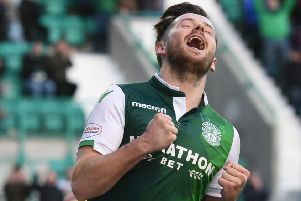 Hibs triumphed 3-0 over Motherwell to get their campaign up and running and Lennon was even able to rest a couple of key players following their European exploits earlier in the week. Darren McGregor and Kamberi have both been nursing knee complaints having played against Asteras Tripolis on Thursday, but Lennon is hopeful the extra rest should see them come through fine for the third round of qualifying. “Flo has a knee problem at the moment and we are trying to find a balance between Thursdays and Sundays,” he told Hibs TV. “We thought we were going to give him half an hour but didn’t need to, so that is a real bonus and he can settle it down now and be fit for Thursday. “Darren has this puffiness in his knee that flared up this morning so he was out and I wanted Marvin [Bartley] to get a bit of physical strength. The former Celtic boss is expecting a tough tie against Norwegian side Molde, who are currently fourth in their domestic competition with the season already under way. “I’m not convinced there is much between them and Asteras, and that was a big learning curve for us,” he admitted. “It will be a severe test, they are half-way through their season and have goals in them.